Photo courtesy of Kate Reid. I’m feeling a little flacid myself. First you get rigid in the lounge, then you get soft after a few drinks and move to the next lounge. If you stay in the rigidity waiting lounge for more than four hours, search immediate medical advice. The guy in the figure looks like he’s only one quarter rigid. I wonder if he’ll be allowed in? Don’t forget your complimentary kleenex. If I see a girl in miniskirt, I will wait in the Rigidity side. I will go to the restroom and move to the Soft side afterwards. Poor Goldilocks is out of luck! Considering my wide stance, I think I’ll need the rigidity lounge or rest room or whatever. @SF. If you can stay in the Rigity Lounge for more than four hours, you are qualified to give advice, rather than receive it. Welcome to the Sperm Bank. Please complete the registration form in one of our two waiting rooms that suits your current status. 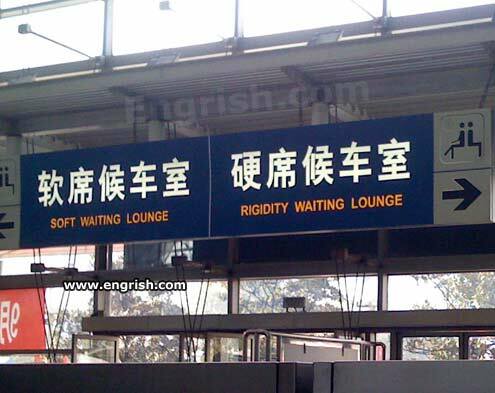 Honey, I’m going to the lounge and wait for my rigidity. This is almost certainly a railway station. There are 2 basic railway classes in China, Soft and Hard, for both daytime and nighttime travel. Soft equates to 2nd Class and above, Hard Class is 3rd Class. The computer that translated the Chinese to Engrish must have a severe case of pliapism. excuse me sir, where is the frigidity waiting lounge? I am neither of these. Is this rigidity in your pants or are you just happy to see me?